I’m 10 hours into Digimon Story: Cyber Sleuths, killing Digimon at the end of the first non-tutorial dungeon, overleveled beyond belief, and getting next to no EXP—but I am so close to getting my Angewomon, you guys. A bit of backstory. Back in my middle school days in the late 90s, there was this fad called “Pokémon”—perhaps you’ve heard of it. As everything “mon” was doing big business among the kids, the Digimon anime was brought to America and started airing on TV (despite it having no relation to Pokémon whatsoever). At that time, I was already big into anime, but the Pokémon anime was a bit too kiddie for me. However, Digimon had a cybernetic Tyrannosaurus Rex and awesome looking angels—so yeah, I was hooked. I watched the first two seasons religiously and only quit watching because the third season not only followed different characters but also was set in an entirely different universe. Still, there’s no doubt I identify more with Digimon than I ever have with Pokémon. In fact, now, 20 years later, you plop me down in front of a Digimon game and the first thing I am going to do is map out how to assemble my dream team of season one and two Digimon. In fact, that’s exactly what I did when I picked up Digimon Story: Cyber Sleuths. Oh sure, I played the story for the first two or three hours. But then I reached the first real boss—a boss that you need to build a full team of three to beat as opposed to just using your single starter. With the need to make a team, I admit to sitting right outside the boss room for about seven hours leveling, digi-volving, and digi-devolving my Digimon. I am now well on my way to my dream team of a WarGreymon, Angewomon, and LadyDevimon. Oh sure, it started out simply enough. But the way leveling and digi-volving works in Cyber Sleuths is like this: You level them through battle like in most JRPGs. Then, when you hit a certain level, you can digi-volve them. Of course, that is not usually their level cap so if you keep them in their current forms for as long as possible, they will be stronger in the long run. Here’s the thing though: Each time you digi-volve or digi-devolve them, their overall level caps rise. To get my Palmon to turn into a LadyDevimon, for example, is a five evolution process. 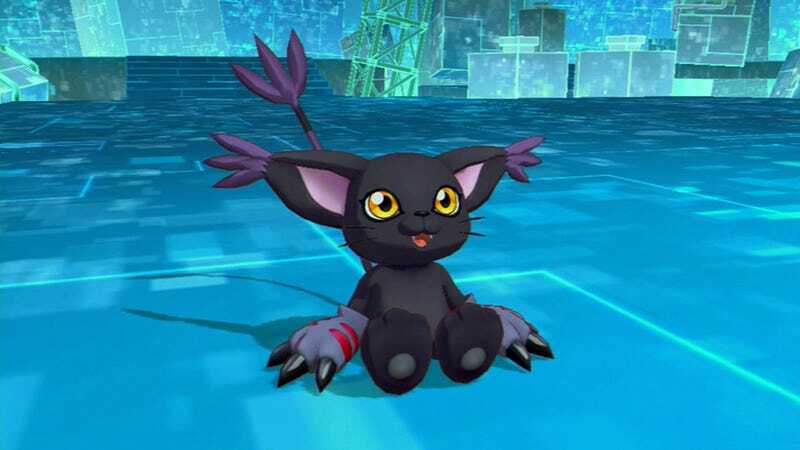 As a BlackGatomon, her level cap is 49—and she only needs to be level 30 to digi-volve to LadyDevimon. …I might actually need to leave this room to hit that cap sometime this century. I know that if I continue on with the plot, I’ll be able to level up much faster. But, I haven’t had time to sit down and deal with the story. Right now, I can mindlessly level up while watching an anime or exercising on my bike—or both at once. Honestly, as a person who has had his perception of time skewed permanently by leveling up two level-60 characters in vanilla World Of Warcraft, even the slow speed at which my Digimon are leveling now doesn’t seem so bad. And let’s be clear: It’s obvious that the game doesn’t want me to do this—to camp in a room at the start like this. There is a team party cost limit (which I can only assume will be raised as I progress); so at this point I can’t even field my Agumon, Gatomon, and BlackGatomon at the same time. …But, hell, why not stay and pound out just one more level? Digimon Story: Cyber Sleuths was released in Japan for the PlayStation Vita on March 12, 2015. It will be released for PlayStation 4 and PlayStation Vita in the West in 2016.